Homes of India - Alina Fedorenko — Broad. From my first travel experience, India inspired me in my photography. This time I returned with a deeper perspective on the real life of people in India, a portrayal of Indian culture that is most intimate. A home is the soul of its owner and the most intimate place of a person. It tells a story about the residents living in it. Every home and its occupants have their own story of life to tell, in India the colours help to tell the rest. I was knocking at the door sill, because this home had no door, but nobody answered, only a beautiful coloured curtain covered the entrance. I´ve opened the curtain and saw this beautiful room with a small child napping, I moved one step inside to take a few pictures. This moment was just magical for me. I had not seen the dog in the dark corner. One step closer and exactly one click, the dog started to bark and jumped towards me. This young man is Shiv Kumar, he is 29 years old and lives with his wife and little baby daughter and they have an english bulldog. It is is very unique and unusual to have this kind of dog in an Indian slum. 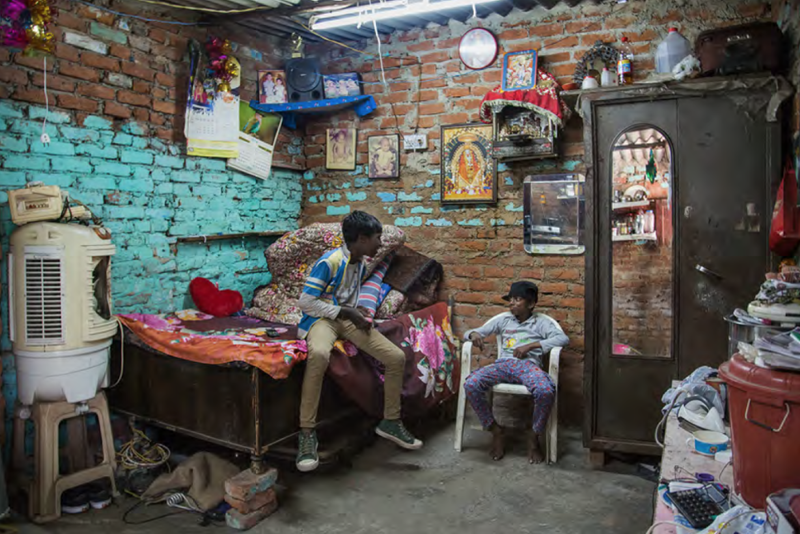 Most of the households in the slum have only one room, some of them are being shared with another family too. This little family is sharing a room with 4, the father works every day to help his boys being educated as much as possible. You can see letters on the wall written which is special, because not all boys have the chance to go to school. Others need to support the families at a very young age. His name is Umed, this is a royal Indian boy's name, meaning hope. He has a disfigurement on his face and is the youngest of 3 boys in the family. His brothers are all very self confident and loud. I saw him playing alone in this room, while all the boys were running with me. It was important for me to make this photograph of the boy alone, even as his brothers ran in to pose. A special photo because he is always the one in the corner. This old lady is a very proud mother of two grown up daughters living nearby with their families. She is 97 years old and still the boss, like she says herself. She tries to sell a few things from the stand next to her bed in her own little room. As a result, her home doesn't have a door. Children living in the neighbourhood come and buy sweets, so she can earn a bit of money. She was working very hard her whole life and won’t give it up until the end. His name is Ansh and he is sharing a small room with his mother and aunt. He is the only male in the family and have to support all of them financially. Ansh has two jobs at the same time. 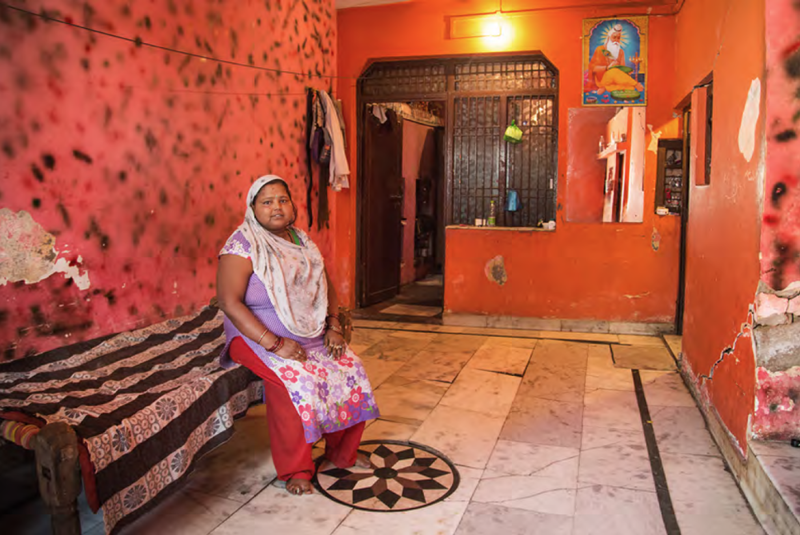 Preeti is very young and has been married very early at the age of 15, she has 3 children by now living together with her mother and husband in a house of two rooms. This family is very religious and have decorated their home accordingly, they even have a small altar built by the entrance. Sharwan is the boy on the left, he is living here with his parents, he is an only child but calls his best friend his brother, who lives next door. This family owns the whole building. Nesha is the oldest of four. Two of her sisters are already married. She is sleeping in the entrance of the house in her own bed. She decorated her room on her own, which is very unique in comparison to all the homes I saw. His name is Samrth and he is living alone with his father in a very small place. He wants to be a designer. He bleaches his clothes all by himself and has many ideas. He loves fashion so much he always tries to add something extra to make the best out of everything. This old man has his vegetables market in front of his door. Together with his son he sells in the slum, they own a small building with two rooms, but the room on the top is only to store things. He was sleeping while his son was running the stand. This home belongs to an old couple married for 61 years. Her husband is outside talking on the phone with his older son. They spend their daily lives together. Nirmal is a very pretty young lady. She is well educated and speaks two languages perfectly. She works at a bank and shares a home with her parents, aunt and her little nephews. 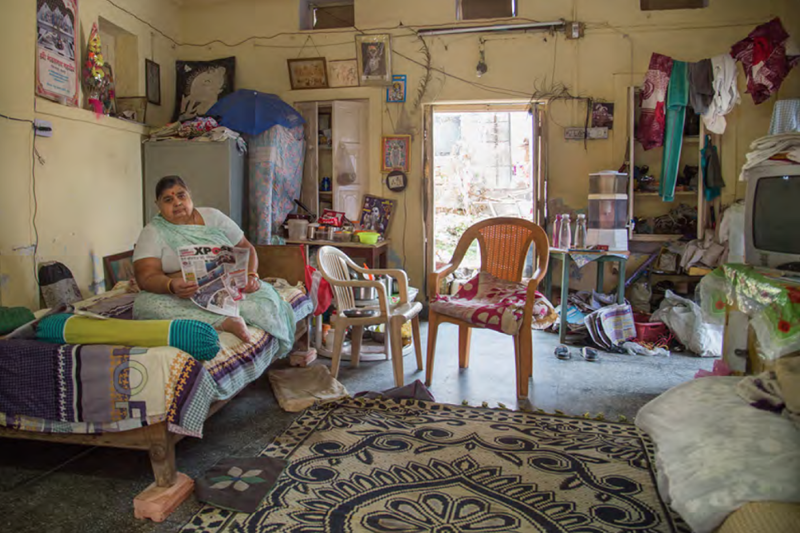 Maryami is living with her mother and son in a very tiny room, they share the house which has two rooms with another family. Maryami is taking care of her son and mother financially, and she works at a female clothing store. Aalia is next door to Maryami’s family, they share a house. The rooms are identically painted and shaped, and are inhabited by two different families. 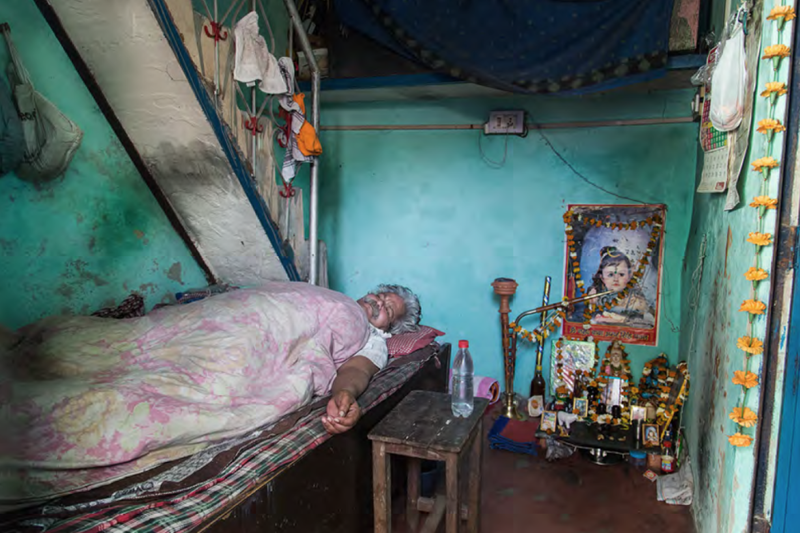 Varsha is a very friendly old man, his neighbours call him the good soul of the quarter. He lives alone and remembers his departed family members everyday. Shari is going to school. After school he loves watching cartoons like every child. He is sharing his bed with his older brother, who is working very late everyday. His father is working too and his mother is taking care of a few kids in the neighbourhood in the afternoons who are not attending school. I portraiture families, men and women, young and old people all living in different slum areas in the north part of India, such as Rajasthan and Delhi. Most of the people in my work live a life at the edge of existence and are socially disadvantaged. 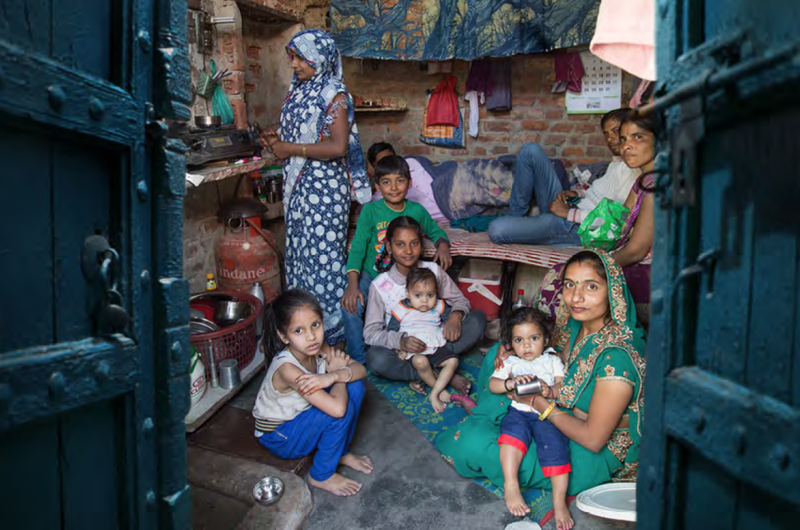 In India, financially unstable families usually share a small house with up to six to seven members. It is a common scene of the slums. Most of these households have only one room, which is being shared with the whole family. One third of the slums are devoid of an indoor toilet. The ones that do have a toilet are not connected with proper sewage systems. Many generations are sharing life and dependant on each other. I want my work also to act as a reminder of the importance of family and shared values, which is a certain kind of wealth that even those who have less can cherish and enjoy.